The fact that Sam likes beige jackets was established early on. In this fine example, we find him wearing a beige coat with a zippered left-breast pocket. There are unzippered lower pockets as well, because we also know that Sam likes to walk around with his hands in his jacket pockets. Sam wears this jacket for the entirety of the Pilot (1x01). 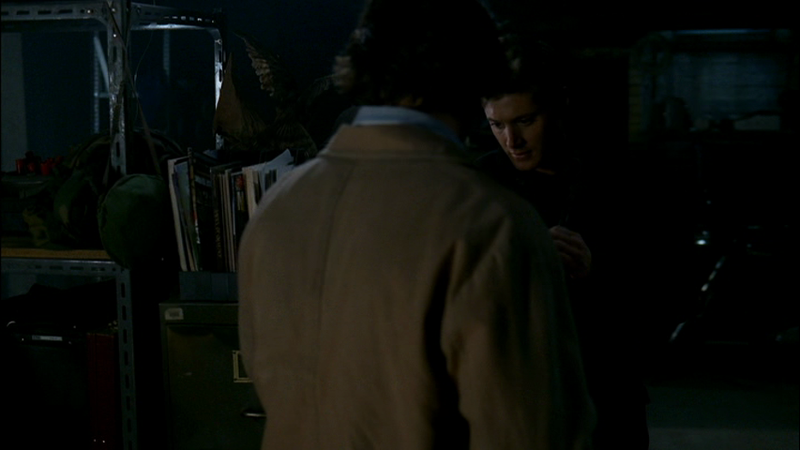 Sam also wears it in Wendigo (1x02) when the brothers arrive in Black Water Ridge and do their preliminary research. Sam was definitely not dreaming of lollypops and candy-canes). He puts it back at the end of the episode when they drop Charlie back at home, and then drive out of town (when Sam sees Jess’ “ghost” on the street). In Hookman (1x07), Sam wears it the entire episode, only taking it off while researching (both times) at the library and at the very end of the episode. It gets a hook through the lower left sleeve near the inside elbow. In Bugs (1x08), Sam wears it for the entire episode, taking it off only once to cover the box full of skulls as Sam takes them to the University. In Home (1x09), Sam wears it at the end of the episode, while he is angsting on the front porch and saying goodbye to Missouri. In Scarecrow (1x11), Sam wears it to see Emily off at the bus station at the end of the episode. In Faith (1x12), Sam is wearing it when hunting the Rawhead at the beginning of the episode. In Route 666 (1x13), Sam is wearing it upon arrival in Girardeau, Missouri, but switches to a warmer jacket after the second death (that we see) occurs. He puts it back on at the end of the episode when it’s time for he and Dean to leave town. In The Benders (1x15), Sam is wearing it at the bar and when he gets taken. The Benders take it off him, but he’s able to find it again when it’s time to walk off at the end of the episode. In Shadow (1x16), Sam wears it for the entire episode, except when he is in costume. In Something Wicked (1x18), Sam wears it for the entire episode. He only takes it off when he has to put on a suit for their first visit to the hospital, and when he is inside their motel room or at the library. In Provenance (1x19), Sam wears it from the beginning of the episode until after they burn the painting, with the only exception being when he briefly wears a nice shirt and suit jacket to take Sarah out to dinner and then goes through the provenances in the motel afterward still wearing the nice shirt. In Dead Man’s Blood (1x20), Sam wears the jacket for the entire episode. He only takes it off when he’s at the diner with Dean in the beginning and hanging around the motel talking to his Dad. In Salvation (1x21), Sam wears this jacket whenever he is not inside a motel room. In Devil’s Trap (1x22), Sam starts wearing the jacket once they hit the road to rescue their Dad. He does not take it off at any point for the remainder of the episode. When In My Time of Dying (2x01) opens Sam is still wearing this jacket. He only changes out of it after his visit to Bobby’s. 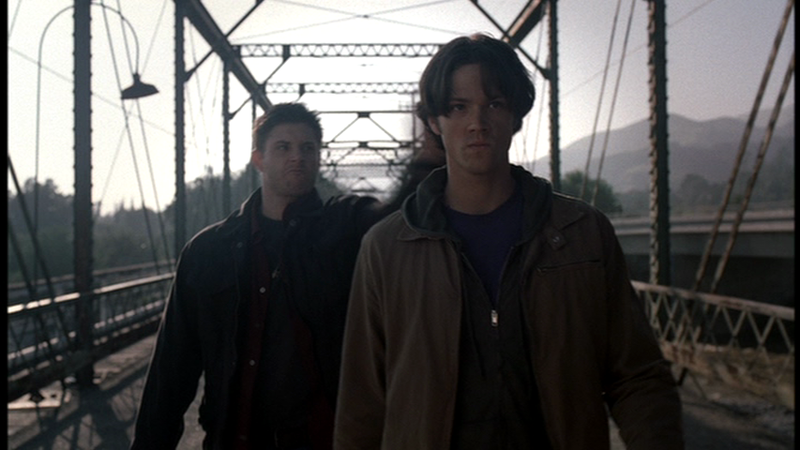 In Children Shouldn’t Play With Dead Things (2x04), Sam is wearing it in the car on the way to see their mother’s gravestone, but has taken it off by the time he is actually there. He puts it back on again when they go talk to Angela Mason’s father at the university, but takes it off again when he is back at the motel. He puts it on again when they go to talk to Neil, posed as grief counsellors. He removes it when he works up a sweat digging up Angela’s grave, but puts it back on when they go confront Angela’s father after finding the empty grave. He doesn’t have it on at the motel, but he puts it back on to go check out Neil’s house and get Angela back in her grave. He takes it off, however, when he is reburying her and we see him carrying the coat in his hand on their way back to the car. In No Exit (2x06), Sam is wearing it at the beginning as he and Dean leave the Roadhouse, and when they get to Philadelphia. He takes it off when they are researching in the apartment, but puts it back on again in the morning when he goes out for coffee. He has it off again while they discuss the fact that the newly kidnapped girl might be in the walls. He is wearing the coat while they search the walls and then rescue Jo, but changes out of it after they dump the cement. In Crossroad Blues (2x08), Sam wears it for the entire episode, except when he and Dean are in the diner at the beginning. In Tall Tales (2x15), Sam is wearing it in the flashbacks of him and Dean investigating the strange occurrences at the university. The only time in the flashbacks that he is not wearing it is when Dean tells HIS version of what happened at the bar – he is, however, carrying it over his shoulder - and when they check out the office (they wear costume jackets). He also takes it off whenever he is in the motel room. In Hollywood Babylon (2x18), Sam wears it from the beginning of the episode until the Exec is hung from the rafters. He then goes jacketless until after the second death (guy thrown into fan), at which point he wears this jacket again until the end of the episode. 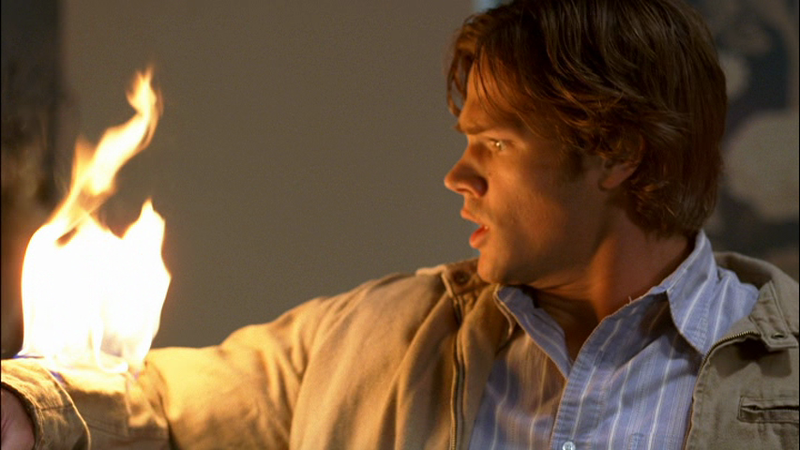 In What Is And What Should Never Be (2x20), Sam is wearing this jacket when he rescues Dean from the Djinn. In All Hell Breaks Loose Part 1 (2x21), Sam wears this jacket for the entire episode. In All Hell Breaks Loose Part 2 (2x22), Sam lies dead in this jacket, but takes it off as soon as he is resurrected. 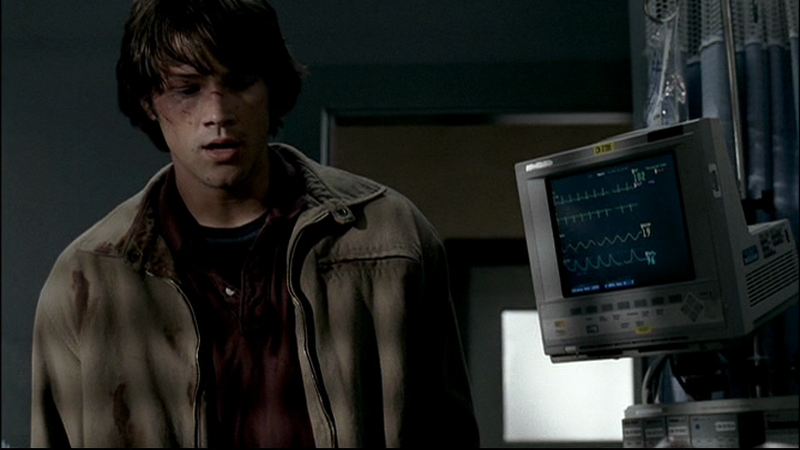 In Bad Day At Black Rock (3x03), Sam wears it from the beginning of the episode until Dean rescues him at the end of the episode. 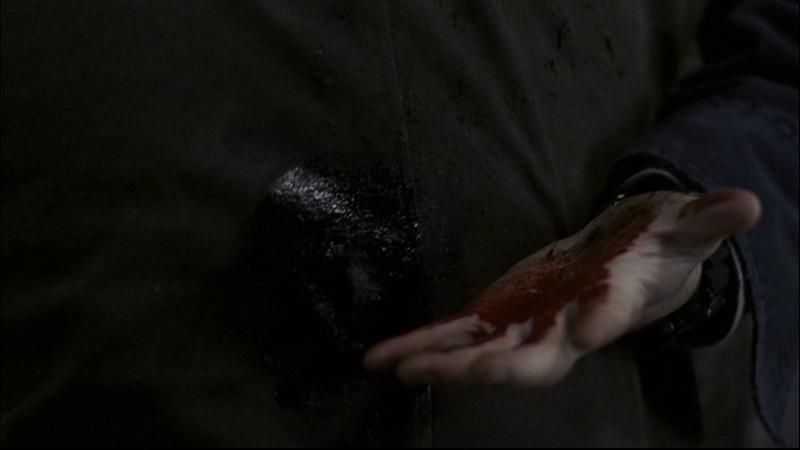 DAMAGE INCURRED AND FATE: It’s repaired after getting a hook through the lower left sleeve in Hookman (1x07). It survived the Daeva attacks in Shadow (the boys have amazing blood-stain removal abilities).